Miltoniopsis do well in the average home or intermediate temperature greenhouse. A night temperature between 55-65 degrees F. and a daytime temperature between 70-80 degrees F. works well. They will tolerate higher or lower temperatures, but not for extended periods of time. We have found that Miltoniopsis grow well under a rather low amount of light (1500 - 2000 foot-candles). If grown in windowsills, we recommend an east or west exposure, or south is tolerated if shielded from the sun. Fluorescent lights are an inexpensive way to supply light to Miltoniopsis as well. These plants also enjoy being grown outside under shade if the temperature permits. Miltoniopsis like to be kept fairly moist with a slight drying between watering. During warm dry weather, they may need to be watered 2-3 times a week, during cool weather 1-2 times a week. A sure sign of under watering would be the formation of wrinkled accordion-like pleated leaves. If this happens, increase your watering. However, this type of leaf wrinkle can also develop from over watering. Over watering causes the roots to rot, therefore depriving the plant from absorbing water because of the lack of roots. Remove the plant from the medium and check the roots if uncertain. Miltoniopsis have very tender and fragile roots. For this reason, we recommend using rain water whenever possible. Reverse osmosis systems are another way to filter your tap water and provide clean water for orchids. We highly recommend Green Jungle Orchid Food, especially formulated to work with rain, distilled, reverse osmosis water or water low in alkalinity. Fertilize with Green Jungle every time you water, all year round. This is the fertilizer that we developed and use on our own plants. The results have been excellent. For tap or well water, fertilizer can be applied almost every watering during the spring and summer months. This should be reduced to once a week during fall and winter. We recommend a half strength solution of Grow More 20-10-20 fertilizer with each application. If you keep your Miltoniopsis well watered, humidity is not a critical factor. 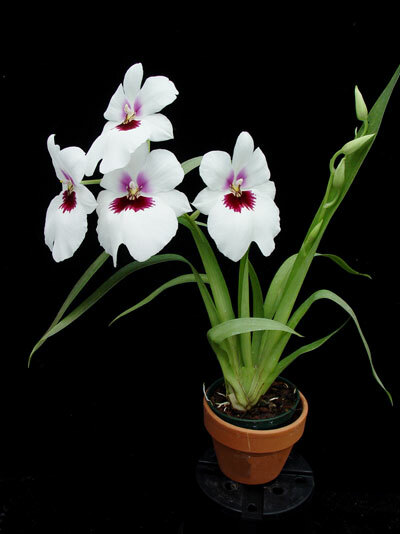 However, Miltoniopsis thrive under high humidity so try to keep it above 50% if possible. Humidity trays or an ultra-sonic fogger can help increase humidity. Miltoniopsis do well in a water retaining mixture. Small orchid bark mix, rock wool mix and New Zealand sphagnum moss mediums work well. It is important that the pot has adequate drainage. These plants like to be somewhat pot-bound so allow room for only one year's growth. Repot once per each year, preferably in the spring.